Web applications are becoming increasingly sophisticated and it is common to need to communicate with various services. There are a number of options to accomplish this task with probably the most popular being to continually poll a server with XHR requests. Other alternatives exist that delay disconnections. These can be tricky to implement and don’t scale well (sometimes worse than polling as they keep a connection open) so aren’t used as much. There is a nice set of demos at: http://www.html5rocks.com/en/tutorials/websockets/basics/ and an interesting article that compares a Web Sockets and polling solution in terms of latency & throughput at http://websocket.org/quantum.html. .net 4.5 introduces a number of APIs for working with web sockets. If you find you need more control than the ASP.net API’s offers then look into WCF as that has also been updated. Currently Microsoft have no plans to release Websockets support for earlier versions of IIS so if you plan to run it on Windows Server 2008 then you are going to have to look at other options such as http://superwebsocket.codeplex.com/. You could also look at the SignalR library from Microsoft which is designed for developing async applications and provides WebSockets (and fallback) support: https://github.com/SignalR/SignalR/wiki/WebSockets. Pull down the latest jQuery library and put it in a scripts directory (I am using 1.7.2) – note jQuery isn’t necessary it just saves a bit of tedious event and manipulation code. Now open up a different browser and you should find you can via websockets! Very nice to get the essentials of the WebSocket implementation in .net 4.5! Nice, this was the first bit of code related to Web Sockets that I was able to get working, there is so much non-working stuff out there because of the earlier prototype versions that were released. I should mention that IIS 8 Express now supports Web Sockets, so full blown IIS is not required; what comes with Visual Studio 2012 is fine. Also, When that handler is created, it should be created as WSHttpHandler.ashx versus ws.ashx, it creates an error because it doesn’t match the code snippet… or just change your declaration to public class ws : IHttpHandler and that name is fine. I have encountered several errors such as.OnOpen, OnMessage, OnClose no suitable method found to override and the ‘packages’ element is not declared. When I nuget Microsoft.websockets, it automatically creates package.config, so does it conflict with the default Web.config? I definitely copy paste the code from this web to my project with slightly changes on the class name. Package.config & web.config are completely different – package.config is used by Nuget for managing the packages you install. If you go to the link below and download the book code examples there is a working example of this which you can use to compare with your setup. sorry to bother you again, I have downloaded the sample and run the sample, but it displayed something went wrong. I have double check that my machine has already enable the websocket protocol for iis. Can you access the example page index.htm? Can you access the handler at ws.ashx? I’m trying this on Windows 8 and IIS server. 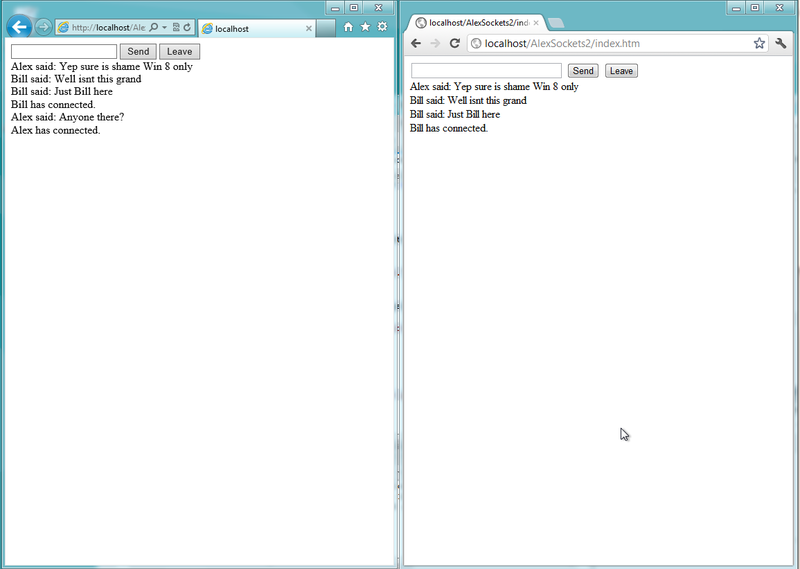 I enabled websockets in IIS. However everytime i go to index.htm it just says Closed. Oops Something went wrong. I can’t see to access ws.ashx. I assume something should pop up besides 404 when I go to that. Okay I got ws.ashx to come up, but this error came up with it. Could not create type ‘WebSockets.ws’. Check the namespace and class name is correct for the ws.ashx file – open the ws.ashx file itself and also the ws.ashx.cs, then recompile the project. I am using an unmodified version of that download, the class name and namespace seem correct and they seem to compile correctly, but upon publishing to IIS it seems to complain for some reason. If this does not work something is prob wrong with your iis setup. That was indeed the issue. It’s been awhile since I’ve had to do anything IIS related. Also you do need to make sure you are at index.htm not just /. It’s working perfectly now, thanks. 3. I tried to access the ws.ashx by remapping the url (index.htm to ws.ashx) (shown in this tutorial http://www.dotnetperls.com/ashx). Unfortunately, I can’t access. But when I did it from scratch by creating a new project, it able to access. Btw, I managed to get the signalR to work. And 1 more, I got an example from this site http://www.paulbatum.com/2011/10/getting-to-know-systemnetwebsockets.html, and his websocket managed to work on my machine, but I must get my VS to run in admin mode. You dont need to map to ws.ashx so undo that. The problem is that you are using the inbuilt web server rather than IIS (the url you say you are accessing – http://localhost:5707/index.htm indicates this). The .net 4.5 websockets extension will ONLY work on IIS. Thanks Dude.. Perfectly working.. Keep it up..